Andrew Lang was a Scottish prolific author, mostly known as a collector of folk and fairy tales. 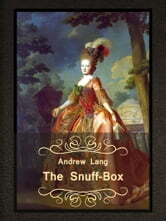 “The Snuff-Box” is a tale, entered in “The Green Fairy Book” collection. The story is about one youth, who once finds the magic snuff-box, which can grant any wish. So, the young man desires the full hat of gold at first, and a golden castle with silver laths and tiles of diamond afterwards. Owing to the snuff-box the youth could obtain all that he wants, but such magic things always become the objects of envy and intrigues. What destiny is waiting for the youth? Read the story to know! We are glad to present you the collection of interesting and colorful folk tales, which will be undoubtedly pleasant to you and your children! Enjoy the reading!